This painting is in oil paint on a copper panel measuring 381 x 505 mm (fig.1). It is 0.6 to 0.8 mm thick and is slightly flexible with a convex bow. Its corners have become somewhat buckled. The back of the panel is coated with worn black paint, the origin of which is unknown (fig.2). When viewed from an angle against the light, the front surface of the panel shows signs of having being beaten during the preparation of the copper plate. There is no indication from X-radiography or infra-red reflectography that either side of the panel was ever used as a plate for an engraved design before being used for the painting. Microscopical examination of the copper where it is visible at the very edges of the painting, shows that its surface was roughened slightly in preparation for receiving the paint. The first application to the front of the plate appears in cross-section as a thin layer of reddish brown material; if this is paint rather than a product of copper corrosion, it is composed of fine opaque red particles with black particles in an undetermined medium.1 It is not more than 10 microns thick. This is covered over with a ground of thin, semi-opaque white paint, on average 10 microns thick (fig.3). This could not be sampled for analysis as an individual layer. The ground completely covers the front of the copper support. Cross-sections show thick, opaque, brightly coloured underpaint beneath the visible image throughout the composition (figs.3 and 4). In most of the landscape this paint is in shades of bright, deep, greenish blue; it is paler in the sky. These greenish blues appear to be composed of blue verditer, smalt and lead white in varying proportions. The underpaint beneath the water contains less blue verditer and more smalt, producing a greyer hue. These colours are not visible as part of the final composition. Their thickness and varying hues in cross-section suggest that they served to lay in the design for the main composition: the water in the foreground, the ever more distant landscape and the sky. It is not clear whether underdrawing was put in before this phase of the process, but it seems likely that the artist laid down the composition with a sharp, crumbly point at an initial stage and then went on to use a similar point to enhance the design as it evolved. Infra-red reflectography shows distinct linear underdrawing along the edge of the river and in the tree, which is not visible on the surface (fig.5). 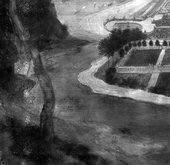 However, details were also drawn or incised into the paint with what looks like a graphite point at an intermediate stage of the painting, and some lines were left visible at the surface to define forms, for example the delineation of the fence around the enclosed garden at the left, and the architectural details of the palace (figs.6‒10). The paint for the visible image was applied in a creamy consistency, wet-in-wet with soft brushes. The water was painted from mixtures of smalt, lead white, black, ultramarine and pipeclay used as an extender.2 A dark green hedge at the right edge contains blue verditer, green earth, black, yellow ochre, ultramarine and pipeclay. 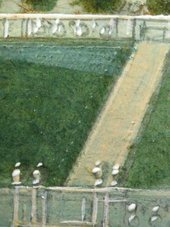 A green field at the right edge contains smalt, lead white, Naples yellow and blue verditer. The sky contains lead white, smalt, ultramarine and black. An opaque, greenish grey at the lower edge contains lead white, smalt, blue verditer, yellow and red ochres and a trace of orpiment. Glazes of green copper resinate in the trees have turned brown with age. As evidenced by an artist’s pentimento, the river was originally painted wider. Until the painting was cleaned and restored at Tate in 2012, there were several accumulated coats of natural resin varnish over the front, and many small, discoloured, non-original retouchings in the sky. There were also some old, small losses of paint and areas of raised cracks, which although stable now, pointed to a history of flaking. There are two types of crackle: a fine network of drying cracks and an equally fine system of age cracking. The old varnish and all the discoloured retouchings were removed in 2012, after which the painting was revarnished with a modern synthetic resin. The same resin was used also as a binder for the new retouching to disguise the old paint losses. 1. It would be unusual to have a brown corrosion product underneath paint; in most paintings examined, the products of organo-metallic reactions are green. See I. Horovitz, ‘The Materials and Techniques of European Paintings on Copper Supports’, in Copper as Canvas: Two Centuries of Masterpiece Paintings on Copper 1575‒1775, exhibition catalogue, Phoenix Art Museum, Oxford 1998, pp.63‒92.